Bulk SMS Software for Blackberry Mobile Phones is developed to send bulk text messages from computer or laptop machine to group of mobile phone users using blackberry mobiles phones devices. Bulk SMS software easily sends thousands of text SMS from blackberry smart phones without internet connection. Bulk SMS broadcasting utility easily works on entire types of blackberry mobiles phones. Mobile marketing tool is beneficial for business marketing, job alert, price alert, seasonal greetings and business campaigns etc. SMS application supports both national as well as international cell phones networks. » Software has ability to send thousands of text messages from blackberry mobiles phones. 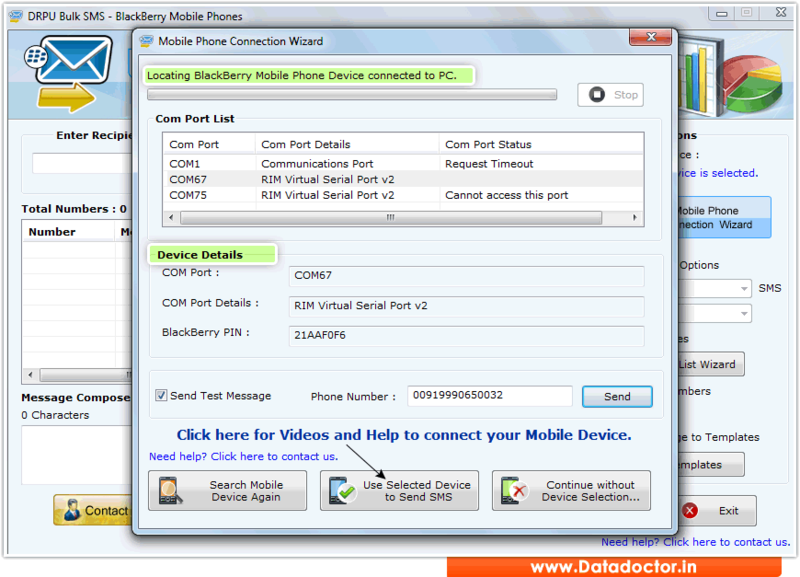 » Easily works on different types of blackberry mobile phone devices. » Utility supports entire national and international mobile phone networks. » No any internet gateway is needed to send unlimited number of text messages from blackberry mobiles phones. » No any monthly charge or setup cost required for using SMS broadcasting software.